NWF Windsurfing Club of the Year 2018! We have enjoyed another fantastic year with our junior windsurfers. Not only have our Team15 club members achieved zone squad selection but also recorded excellent results in both regional and national championships! Well done to you all! Having been awarded the prestigious title of NWF windsurfing club of the year 2018 we have no intention of resting on our laurels! Our dedicated team of windsurfing instructors and volunteers have big plans to expand our windsurfing provision at the club during the forthcoming year. 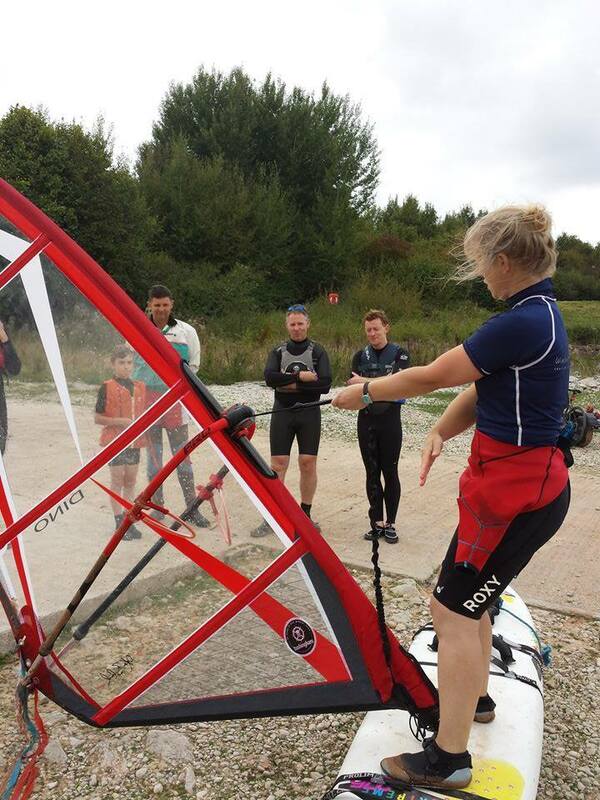 Over the past couple of years, we have run a number of very successful windsurfing taster sessions, which were fully booked and really enjoyed by those who took part. As a result of the success of these, the Club has now invested in more windsurfing equipment which will enable us to offer a wider range of windsurfing training for both adults and juniors. We will be running more tasters this year, as well as RYA Start Windsurfing courses. Find out more about our taster sessions and available course here. We are currently running a number of RYA Start Windsurfing courses. For more details of dates and to book, visit the Training tab above. Secure your coaching session with Pro-Junior Techno and Youth RSX Coach, Ali Masters. Get your 2019 Windsurfing season off to a flying start! Top windsurfing coach Ali Masters will be running a two day coaching course here at Burton Sailing Club this Spring. Places are limited to just 8 people, so if you would like to register your interest or find out in more detail, just what the course entails, please contact Windsurf instructor Andrea Longley. Places will be available to Burton Sailing Club members on a 'first come, first served basis', so please book early to avoid disappointment. Bookings are now being taken for places available on our popular weekend 'Start Windsurfing' Courses and taster sessions which take place over the summer here at Foremark reservoir. Our friendly windsurf instructors welcome you to take part in one of our two day courses which are suitable for both adults and juniors aged 8 years upwards. Windsurfing is a great, fun, activity suitable for the whole family that will improve your fitness and confidence on the water. No experience is necessary and all basic equipment needed to get you out on the water is supplied by the club. Junior members that wish to can progress to become a 'Foremark Flyer' taking part in regular Team 15 regional and national racing.